Once upon a time there was a little girl who from her earliest years was like a ray of sunshine in the lives of others. She was cheerful, caring, and loved helping others. She loved the Lord, and gave her heart to Him when she was only about 3 years old, and she never turned back. This little gal was always most willing to help her mommy serve the many guests who came to their home all year round, including many so-called “bums” during the hard depression years of the ‘thirties. She had great sympathy for anyone sick or in trouble, and was even known for such adventures as, at about 10 years of age, rescuing a sick, smelly man who was laying in the ditch, dragging him home, tucking him into bed, and nursing him back to health with soup and coffee and rest. Even years later, when she learned that alcohol had been the cause of his troubles, she still was glad she’d been able to help. As a teenager, she was active in her church, teaching Sunday School and ministering in any way she could. She stood strong during her high school years, even when fellow students made fun of her clear Christian stand. Yet her sunny personality and caring ways also won her many friends, and even many offers of marriage over the next few years, as well as the opportunity to frequently be a bridesmaid in the weddings of the many girls she had befriended. When she graduated from high school, she first took nurses training. This was during the Second World War, and she had to care for many soldiers with terrible wounds and illnesses. The conditions were so difficult that she finally had to leave her nurses training, for her health broke down. But she did not feel sorry for herself. Even in her time of illness, she took care of her uncle who was dying, and she continued to minister in whatever simple ways she could. 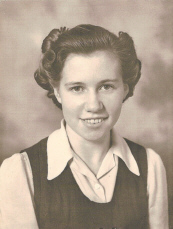 When she felt better, she took a secretarial course, and meanwhile continued to minister in her church by leading the youth group, taking them, mostly boys, on all kinds of wild outdoor adventures, as well as leading many of them to the Lord. Then she went to Teacher’s College, where she became involved in para-church ministry, particularly Inter Varsity Christian Fellowship. Again, she influenced a number of her fellow students to follow the Lord. One young man who came to know and love the Lord through her influence, also came to love her, and when he asked her hand in marriage, she prayed about it, and with the leading of the Lord, they were joined in holy matrimony. She and her husband have now been married more than 50 years, and have faithfully served the Lord together all that time, in many ways. This young woman taught school until she had children. Then she stayed home, becoming very good at stretching a dollar very thin, in order to be there for her four children. She also continued to teach Sunday School, lead Christian children’s clubs, invite in every one she met for meals all through the year, help her husband with his ministry in Inter School Christian Fellowship, sing in the church choir, be a counselor at children’s camp,s and so much more. Over the years she lead her children to the Lord, and every one of them is following the Lord to this day. She also lead many of their friends to the Lord, through her loving, caring ways, as well as children in the church programs she lead, neighborhood women that she invited in for coffee, young men who would come to the door selling Fuller Brush or other products, and so on. There are literally hundreds of people who always call her “mom,” and many people in both full-time and lay Christian ministries, all over Canada and even the world, who point to her as their spiritual mother. A few years ago, this wonderful, saintly woman of God became ill with cirrhosis of the liver, even though she had signed the pledge at four years of age, and had stayed faithful all her life to her vow before God never to drink alcohol or use drugs. As she became more sick and tired, one by one she had to give up her ministries. Another side-effect of her illness was that toxins were building up in her body, and started affecting her brain. Now this exceptional woman of ministry with a servant heart spends her days in a locked, secure nursing facility because she has advanced dementia. She can no longer feed or dress or bathe herself without help, after close to 80 years of faithfully serving the Lord in so many ministries. Because she does not have self-control any more, she does things that would shock many people, who would wonder how a Christian could act like that. She cannot carry on an intelligible conversation for more than a few words now and then. She often does not know even her own family members, including her loving husband. She does still enjoy listening to hymns and to people praying, though, and often is found haltingly sounding out words from the Bible she loved so much and knew so well. Tears often roll down her cheeks at these times, as she still manages from time to time to commune with the Lord who has been so precious to her all her life. But despite her limitations, this woman is still ministering today. She is ministering by the legacy of all she did in her lifetime. And she is ministering by providing an opportunity for her husband, children, and the many friends she has made over the years, to minister to her, to learn to love her as Christ loves each of us, unconditionally, despite her many bizarre behaviors, and often an inability to respond in any clear or meaningful way to those around her. In some ways, she is ministering even more profoundly than ever before, because through this experience in which it seems she cannot minister at all, many people she has ministered to in the past are learning to be true servants, true followers of Jesus, true ministers in Word and deed, as they visit her and try to make her comfortable. They are also coming to love the Lord more, as they reflect on her life. And they are finding themselves moving into ministries to the lonely, the unloved, those who are old or sick or disabled or suffering from many different disabilities, whether they are institutionalized or in homes or even on the street. The ministry of this wonderful woman of God continues to spread out and grow as her influence and care in the past and present is even now teaching many others to love and serve and minister before God and to others. How do I know this is true? Because this woman is my mom, Marjorie Wright. People say to me, “My, it must be hard visiting your mom every day or two when she is like that.” And at first, it was, even though I love her. But through my mom, in the midst of this great trial and sorrow, God continues to teach me, and soften my heart, and mold me, and helps me to trust in Him, and to learn to be joyful in all things. All my life I have wished aloud that I could be like my mom, but I don’t have her personality, and I have even been told, “Give it up. You could never be like her.” And yet, it is in this time of dementia, of institutionalization, when all the seemingly good things about her have been whisked away, that I am learning from the opportunity to care for her and minister to her, to truly, finally start to be more like my mom, this wonderful ministering saint, who has always been such an example to so many people of what it is to be Christ-like, to be in real ministry in every aspect of her life, no matter what happens. Thank you, mom! Thank you, Lord! Thanks, Debbie. I’m glad you enjoyed it!